A bunion is a common foot deformity that affects the joint at the bottom of the big toe, causing a bony lump to appear on the side of the foot. If you develop a bunion, you’ll notice that your big toe no longer lies straight; instead, it leans towards your other toes and presses up against them. As the sac of fluid around the affected joint swells up, the big toe becomes stiff and painful, impairing the foot’s range of movement. The foot bone (known as the first metatarsal) that’s connected to the big toe is forced out of alignment with the bones next to it. X-rays of bunion sufferers’ feet show the foot bone pointing outwards and big toe bones pointing inwards, forming a ‘v’ shape. 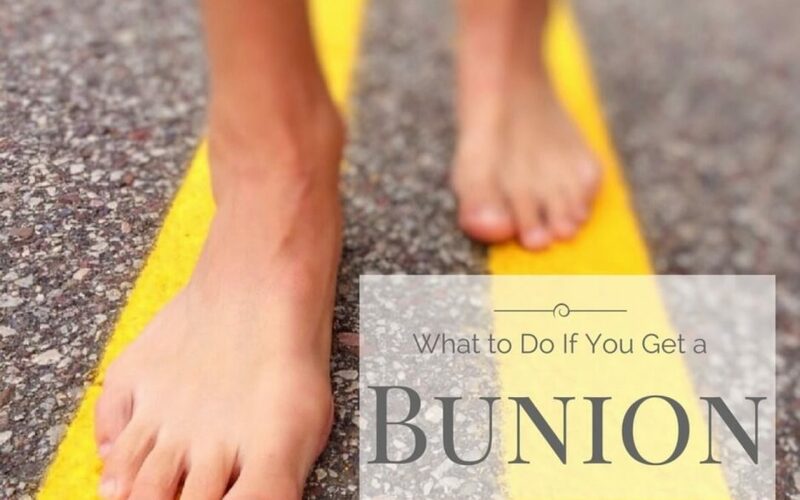 Bunions tend to get worse, especially if left untreated. The bony lump becomes more obvious and the foot more misshapen; toes may even overlap. That’s why it’s vital to be familiar with the risk factors for bunions and know what to do to protect your feet if you develop one. The exact cause of bunions is unknown, but certain physical factors that lead to abnormal foot and ankle function, such as unusually flexible joints, weak muscles and loose ligaments, can increase your risk of suffering from them. Bunions are also associated with rheumatoid arthritis, which causes inflammation of the joints. What’s more, exposing your feet to excessive pressure and strain by wearing tight shoes may contribute to the formation of a bunion or aggravate an existing one. As fashionable, feminine shoes with high heels and pointy fronts often squeeze the toes together, bunion sufferers are more likely to be female than male. ‘Some studies report that bunion symptoms occur nearly 10 times more frequently in women,’ emphasises health resource MedicineNet. If you develop a bunion, it’s essential to wear comfortable, roomy footwear. Look for soft leather shoes with rounded fronts and low heels. Go to shoe shops that offer several width fittings, as bunions make feet progressively wider. Try not to spend long periods standing or walking, and take regular breaks when exercising, as that’ll reduce the strain your feet are under. If your bunion feels sore, an ice pack wrapped in a tea towel can help. There’s a bewildering array of over-the-counter products aimed at bunion sufferers, ranging from felt pads to cover the affected joint to splints that force the big toe to lie straight. However, they’re not suitable for everyone (people with diabetes or poor circulation should be particularly cautious) and aren’t always effective. That’s why professional support can be invaluable if you develop a bunion. By consulting a podiatrist, you can ensure that you receive the right bunion treatment for your individual needs and keep the problem under control. Our London podiatrists use cutting-edge gait scanning techniques to identify problems such as bunions and develop treatment plans. We provide custom-made orthotics to relieve bunion pain and improve foot function. We can also suggest foot-strengthening exercises. Conservative treatment is all that most bunions need; but if yours is an extreme case, our team can advise you about whether or not corrective bunion surgery would be beneficial. It’s important to bear in mind that bunion sufferers are vulnerable to a number of other foot problems. For example, the pressure exerted by the big toe on other toes can lead to ingrown toenails, calluses and sores. But don’t worry – we also treat those ailments and many more at our London podiatry clinics. For expert treatment for bunions and other foot problems, please call Feet By Pody today on 0207 099 6657 or book a podiatry appointment online.